I’m taking a break from the buffet tables I have shared the last couple of weeks to bring you something a little different. I have a goofy rule about not buying anything unless I can think of at least 5 ways to use it in under 30 seconds. Sometimes that’s a real challenge. Other times, however, the ideas just flow. I recently conducted an exercise in my “Art of Tablescaping” class that engaged the students in looking at a centerpiece item and brainstorming about all the different ways it could be used. The genesis of these two tablescapes is that exercise, along with napkins & matching placemats I bought year-before-last at Burlington. The white flowers remind me of Fuji mums, and the gentle nature of the design makes me think of a quiet Japanese garden. I figured I could bring out a little or a lot of that Asian feel depending on the additional elements used, but that both looks would work well for a Spring tablescape. What you’ll see here are side-by-side comparisons of how switching just a couple of elements can change the whole look and feel of a tablescape. See if you can spot the subtle differences. “Mum’s the Word” on the left would be great for any “business casual” get-together, and “Zen Garden” on the right would work well when serving something fun like sushi or takeout Chinese food. 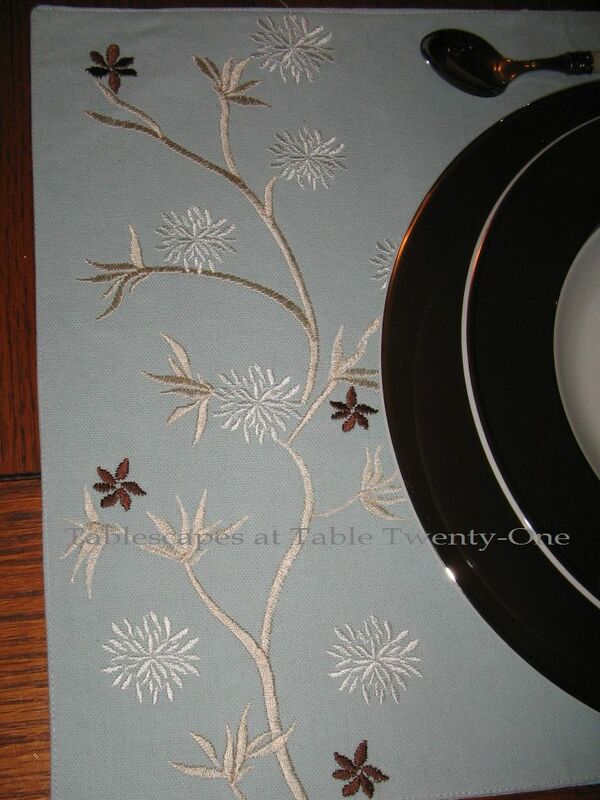 Besides the robin’s egg blue placemats and napkins, both place settings utilize Z Gallerie’s “Delfina” china with its glossy white center, chocolate brown rim, and sophisticated silver edging. Making the napkin look a little different is as easy as changing the napkin ring. The napkin on the left has a silver-rimmed faux mother of pearl ring (I bought them at Old Time Pottery, but Z Gallerie has them, too), while the ring on the right is a natural rattan (Pier 1). The setting on the left uses clear glass everyday glassware from Old Time Pottery. The setting on the left replaces the all-American stemware with a simple white sake cup from World Market. 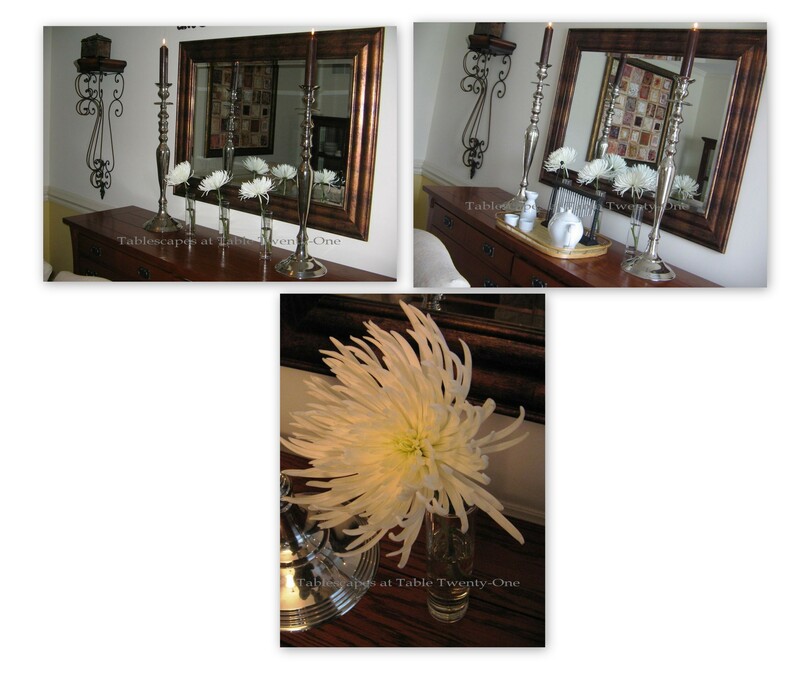 The overall look of the buffet is altered by the simple addition of extra elements that steer away from the more austere look of simple candles and florals as pictured on the left. 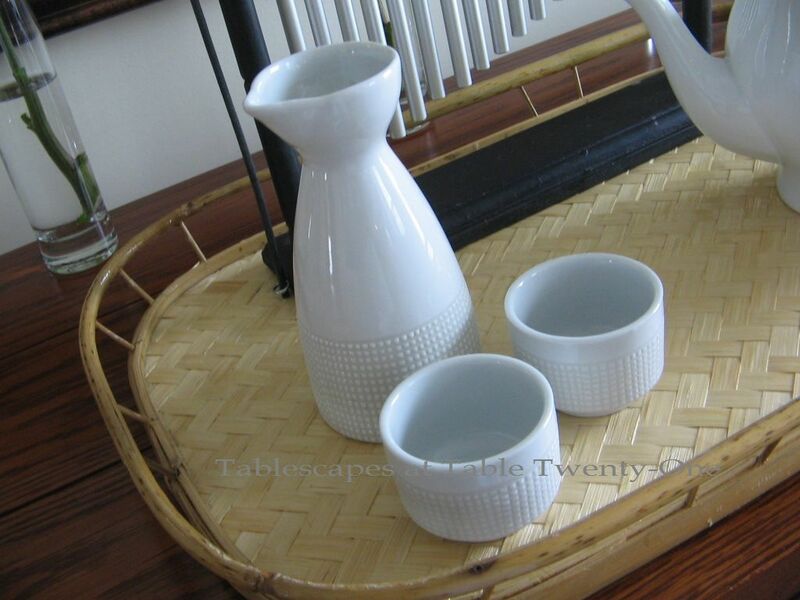 The simple white World Market sake set and teapot (T.J. Maxx) definitely lend Asian influence. 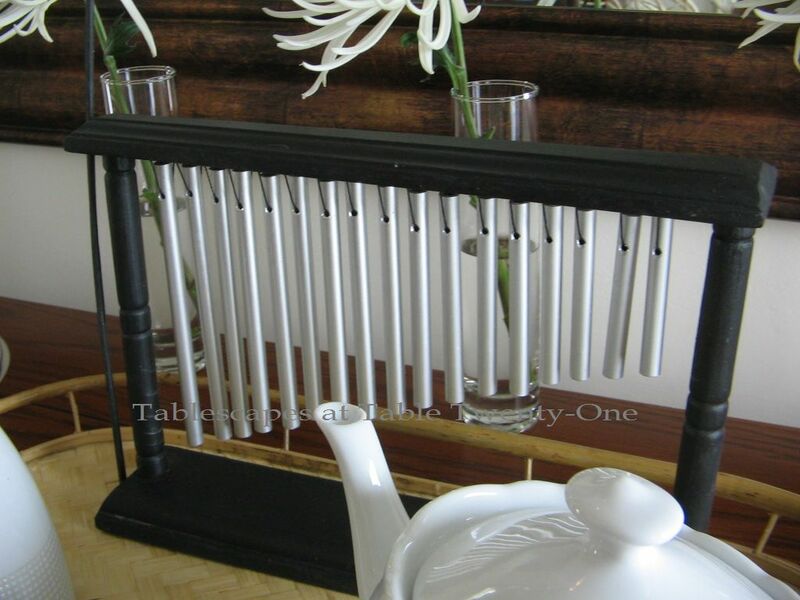 The melodic sounds from soothing Japanese chimes can be used to gently alert your guests that a feast awaits. Subtle differences can make a world of difference! I am joining Susan and many other talented tablescapers from out there in the world for Tablescape Thursday again this week. Also hooking up with The Style Sisters for Centerpiece Wednesday. Hope to see you there! Ahh, I love your twist on these two themes! 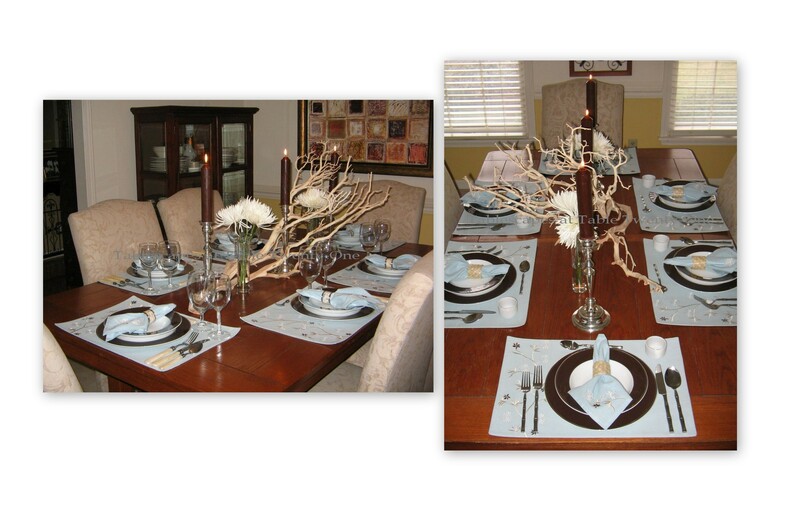 Great examples of how you can use some of the same table elements to achieve more than one look! I saw that same manzanita branch at our T.J.’s but unlike you I couldn’t see what I could do with it so I passed it up! 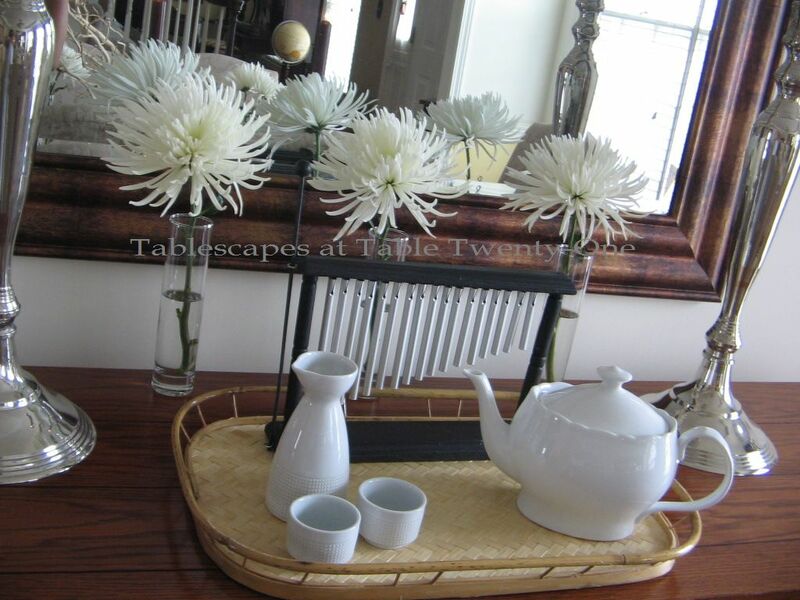 Your clever use of the white fuji mums accented differently really works! 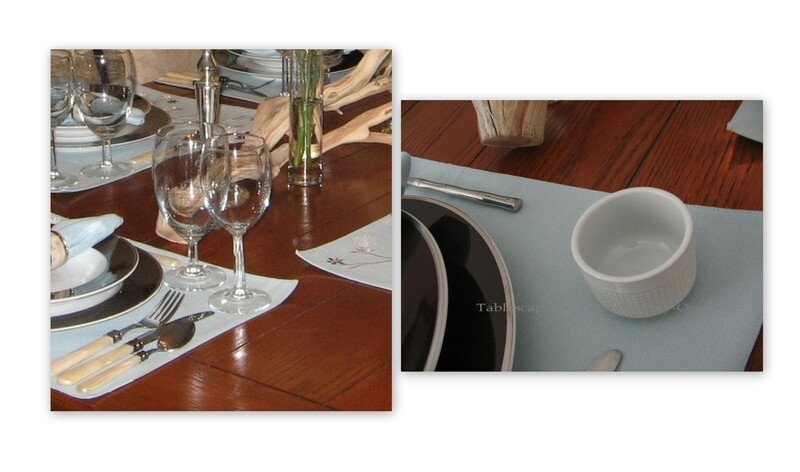 The napkins rings, flatware and glassware all made a big difference! You certainly get an A for creativity! Alycia, this is simply gorgeous!!!!!!!!!!!!!!!!!!!!!!!!!!!!!!!!!!! I love the challenge of the “how many ways can I use this” exercise. It really gets your creativity flowing. Lovely table, love the soft blues and very Zen. This table is absolutely stunning. I can just see you sitting in the aisle with a napkin on your head. I am usually doing the other thing, trying to figure out how much trouble I will be in if I buy it. The china is so perfect with the linens, and all your other touches are just incredible, especially the chimes thingy. I love these tables! That icy blue is one of my favorite colors right now and the contrast with the chocolate…perfect. Really like those pearl look handles on the flatware. I was cracking up thinking about you with the napkin on your head…but I can also see how that would make you think better! I am like you though in my thought process, but not the 5 different ways to use it. My thought process usually goes more along the lines of where can I stash this when I get home so I can pull it our several weeks from now and reply ”this old thing” when Scott says “when did you get that!” yes…it happens a lot in our house, and no, he doesn’t fall for it anymore. Some women wish their husbands would be observant of the little things…Scott will even notice if I have on a new pair of earrings! And let’s just say, there is more jewelry than dishes. But he hasn’t kicked me out yet, so I guess I’m in the clear! HA. Alycia, LOVE the versatility of this style! Both versions are beautiful!! Love the Fuji mums! What a great flower, with such an impact!! You know ZGallerie is one of my favorite stores; and their tabletop pieces are just awesome! You did a great job! Absolutely luuuuuv it!!! Big fan of the branch centerpiece!! Alycia…you are the magician of tablescapes!…You are able to add or delete a few items and make the table have an entirely different feel.. The tables you presented today are wonderfully enchanting and of course ah-so, zen. I think it’s wonderful you can create different themes from the same china and changing a few accessories. Mums are great as you said, they last a long time. Your students will learn a very important lesson. I love Zgallerie…I just popped in there yesterday and didn’t buy a thing….. Your blue color is so lovely. TJMaxx, World market and Marshalls are have great bargains. Well done, Alycia!!! I love your “goofy rule”. I’m gonna adopt that too! Beautiful tables! Happy Spring! I do the same thing at HomeGoods…many times I put things in a cart on “speculation”. While I speculate I walk around the store trying to see how much more trouble I can get into. I chuckle each time I think of you sitting in the aisle with a napkin on your head. Obviously it works. You conveyed the intended mood and its gorgeous. I may cop a squat the next time I’m in TJ Maxx! Both are beautiful, and very zen. I will send my four gkids over to play those chimes for you! Not so zen! Another beautiful tablescape! I just love robin’s egg blue! Wonderful job, I do love the placemats and napkins and so interesting to read as you show your simple changes in each tablescape. The branch is great too, I do go to TJ Maxx every week and always seem to find several interesting items and must decide what to purchase and how I can use it in more than one tablescape or vignette. I love the napkin on the head decision making process ha ha….I am with you on only buying something if you can use it in many ways! Such great ideas and tips you have shown here! 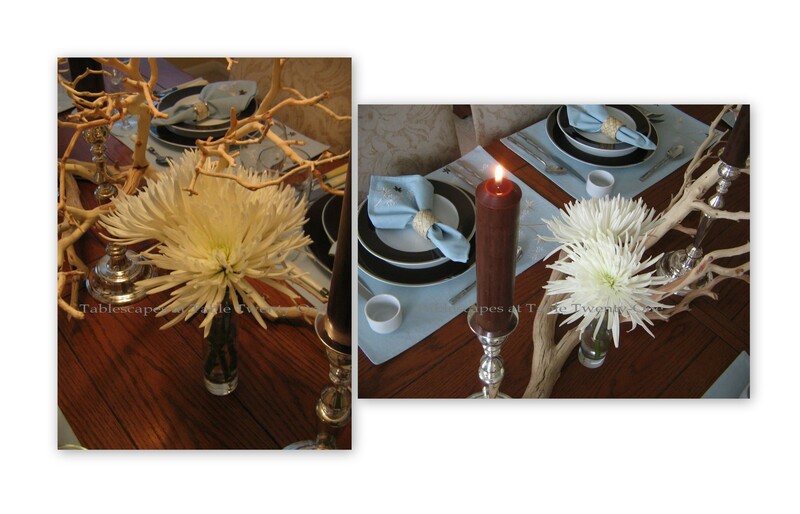 Simple changes can make a big difference…thanks you so much for sharing all your ideas with us on Centerpiece Wednesday! Now see, this is one reason that I love coming here. I feel as if I learn a little something on top of the inspiration. Here, I saw the differences a subtle change can make. I really loved the side by sides and enlarged them so I could get a better look. I love Both designs so beautiful. The image of you in the store with a napkin on your head is priceless! 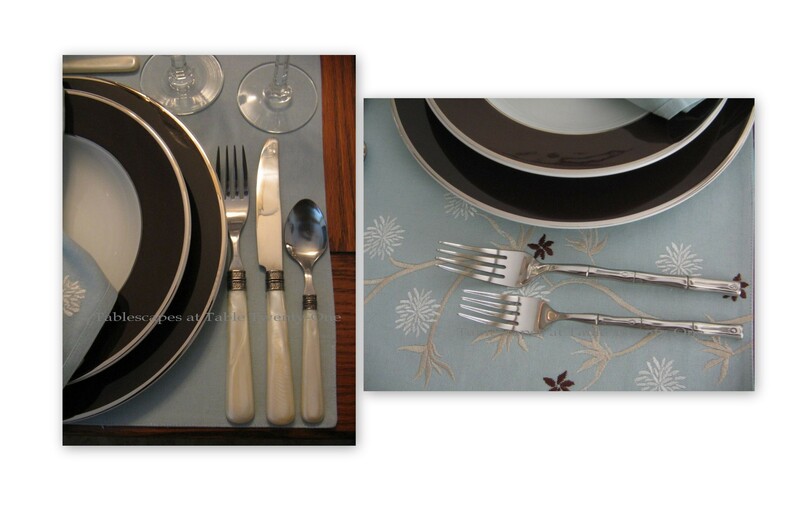 I also always look at my Tablescapes with other flatware, and mix my dishes for a new look. Thanks so much for your sweet comments on my Easter Tablescape. I hope you and your family have a wonderful weekend with your family. You are just proving that you can have an entirely different table with just a few simple changes. No need to spend big $$ when you have solid basics! I remember a post you did on how you organize your table stuff, so I know you have lots of options. But I reuse tons of stuff all the time and somehow end up with a dramatically different look. You do a good job of demonstrating how! So nice you came by to see me! I appreciate the fun feedback! This was such a fun and interesting post. I really enjoy all your tips and this was a great way to show how easy it is to change the “feel” of a table. Those dishes are just beautiful and I’m sure you can think of more than 5 ways to use them! You’re so creative. I love how your mind works! HEY, that was FUN!!! It really proves that small changes can do a lot to change the look and feel of a table. To me, that’s why every LITTLE element is as important as every BIG one! I’m glad to hear that I am not the only one always making rules for myself. Mine are a lot simpler, like “do I love it?” which, come to think of it, gets me in a LOT of TROUBLE!